When a child hangs up his cleats, soccer moms go into retirement. When a kid hangs up the cleats, a soccer mom retires. It&apos;s over. After years of sweating or freezing watching a multitude of games in various sports, my career as a sports (mostly soccer) mom is over. I’m being forced into retirement, no longer sitting on wonderful bleacher seats to watch the only player who mattered to me: my son. As a sports reporter, I&apos;ve seen thousands of professional games. You analyze and question all the different nuances of the game as you watch. You go to practices, pre-game warm-ups, stay through the game and then go the post-game to get players and coach’s reactions. You are not a fan during that time. This is not a complaint, but a matter-of-fact element of the job. You absorb, question and process the sport. When you are a mom, it is simpler but more emotional. And at the younger ages, it&apos;s very pure. We let our son try a variety of sports: baseball, basketball, tennis, volleyball, golf and soccer. He did reach his black belt level in taekwondo, a shared accomplishment with his dad. 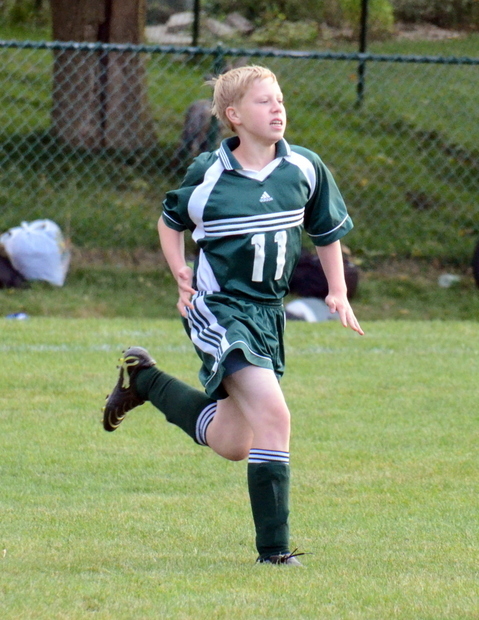 Soccer was a mainstay for my son and the sport my husband played in high school and college. For the star athlete, sports may be their best way of racking up accomplishments and satisfaction. That wasn’t the case for our son. He took the route of doing it for fun and to be part of the team. No travel for any sport. He is not a gifted athlete. He was born later then the kids in his grade, so size and physical maturity didn&apos;t measure up to his teammates. He did possess the ability to be coached and was a terrific teammate. We stressed that he focus on playing defense, since that would be appreciated in any sport. Too bad his freshman soccer coach insisted he play forward instead of defense. It wasn&apos;t a fit, but he never complained. He just decided just to play recreational soccer instead. Now nearing his sixteenth birthday and having other interests, my son will be hanging up his cleats for good. Scratch that. He NEVER hung up anything. That is something as a mom I will not miss at all. Shoes, gloves, dirty uniforms and empty water bottles never seem to make it to the right place. Add these to the list: Washing mud off shoes, trying to get grass stains off a uniform and buying shoes last minute because of a growth spurt. There are several things I will miss. Gratefully, my husband is a camera buff so the most magical sports moments have been caught. Like as a 5-year-old when he ran to first base with the biggest smile and just sat down once he got there. One indoor soccer season as a goalie, my son was nearly flawless and only giving up a few scores. His second year of golf at age 10, he played a nine-hole public course and got a hole-in-one. He had no clue what that meant. Coming off the bench in a volleyball tournament in eighth grade he led a win in a deciding match and was picked up by his teammates in celebration. After that day he would be a starter. Watching him use his hands to break several boards to earn his black belt, I was just I relieved he wasn&apos;t hurt. There were plenty of times he would be on the bench, but he liked to talk with his teammates. He never disrespected a coach or an official. Here is some unsolicited advice to young parents. Enjoy the moment, don’t push and make sure the kids are having fun. Chances of becoming a professional are really, really slim. If they do have phenomenal talent, let a coach tell you. You need to have perspective when you analyze your child&apos;s ability. Don&apos;t live through your son or daughter. Last weekend it felt sad leaving the soccer venue for Jaxon&apos;s last game. But he played hard and had a smile when he was done. I didn&apos;t realize until that moment I was retiring from a great job: soccer mom.